Not yet a MyChart user? At your next appointment, ask us for MyChart access. Already have a MyChart Activation Code? 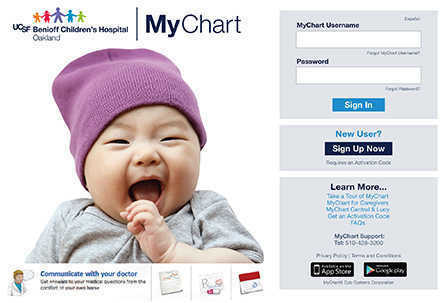 MyChart is an easy, confidential way to stay in touch with Children’s Hospital Oakland using a secure internet connection. There's no charge for using MyChart. It requires signing up at your next appointment to receive an account activation code. Unlike email, MyChart uses secure technology. Only you, your provider and your provider's authorized staff have access. What can you do on MyChart? Ask your health provider for more information about signing up for MyChart. Admitting, Registration, Patient Financial Counselors, Ward Clerks, and Charge Nurses can give and collect signed MyChart Consent forms and give you an Activation Letter with your code. To set up a Caregiver account in MyChart, supporting documents may be needed, such as proof of guardianship or verification through Health Information Management (HIM). Once you receive your Activation Letter, go to: https://mychart.cho.org/MyChartPRD/ and click "New User" to enter your activation code (within 2 weeks or activation code expires). Create your user-name and password. Designated computers are available to our patients for MyChart use in the OPC lobby, Main Hospital Cafeteria, Claremont Clinics, Walnut Creek, ED, and Financial Counselor Office. The Family Resource Center computer may also be used during business hours. FIND Navigator volunteers stationed in the ED and Primary Care Clinics are available to assist patients who have received their activation letter with creating their MyChart account. To find answers to frequently asked questions about MyChart, visit our FAQ page. Need help? Contact MyChart Customer Service at 510-428-3200, 24 hours a day, seven days a week. "This hospital is meant for children. They went far and above the call of duty to help my baby, and I felt she received the best care possible. These people care." Melissa H.